There’s something soothing about the thought of coming home from a long day’s work, sitting back on your couch, and admiring the sight of multi colored fish swimming in the distance. Add to that the sight of a dimly lit aquarium with soft sounds of running water and you’ve got yourself a relaxing ambiance. The best fish tanks are easy to maintain and can be started for a low price. Although this the idea of a fish tank sounds relaxing and easy, when people decide to get pet fish, they mistakenly assume that caring for them will be a fairly easy process. Although fish are far easier to manage than dogs or cats, there is still quite a bit of maintenance that goes into caring for them. If you are anything like me, you’ve most likely come across a wide variety of options while trying to find the perfect fish tank. If you’re feeling overwhelmed by the long list of choices, I’m here to provide you with some hope! 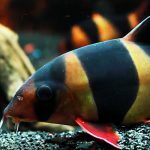 I’ve compiled a list of the best fish tanks to help you narrow down your search and find the perfect aquarium. Many of the options listed below have received high ratings on Amazon and hundreds of positive reviews from satisfied customers. 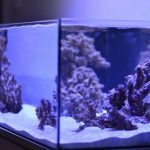 If you’re ready to find your perfect tank, read on and take a look at some of the best options available this year. This first tank on our list is sleek and modern with an easy to assemble design. It has a hidden high-quality filter, a dual setting LED light, and a RITE-SIZE Z filter. 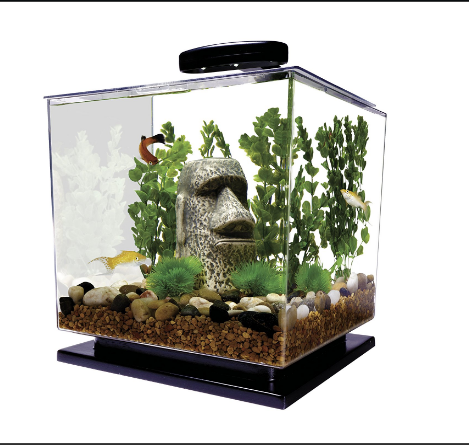 The tank comes in a curved glass design and it is available in both 3 and 5 gallon models. It can be used for freshwater and salt water fish. The aquarium comes with an advanced filtration system and uses activated carbon, bio foam, and a special floss within the filter cartridge. It comes with a removable foot stand. The stock pump is very quiet. Comes with an LED light with night and day settings. The back chamber is very small which might not leave a lot of room for the cord, filter and pump. The stock light is somewhat low quality and dim. This particular product is an Amazon best seller. The Tetra 29095 has an elegant design and it comes with LED lights, a filter, and an air pump. This tank is also made out of styrene plastic instead of glass and it’s excellent for betta and tropical fish. The top lid is also made out of plastic and it has a feeding hole built into it so that the lid doesn’t have to be removed for feeding. It comes with a high quality clip on LED light with 9 individual lights. The filter and pump can be very loud. The material that the lid and filter are made out of is somewhat low quality and may need to be replaced soon after your purchase. The Fluval Edge Aquarium has a contemporary, modern, and just down right cool aesthetic. The tank has a 3D cube design and it’s nestled under two blocks, which gives it a floating appearance. 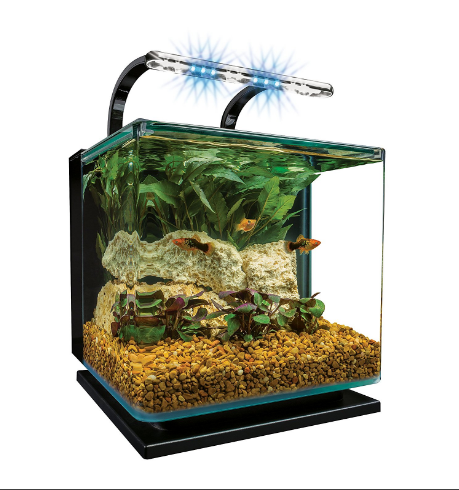 The high quality LED light included with the tank comes with 18 white bulbs and 3 blue bulbs. It also comes with a power filter and pump which clean out the water in a quiet yet efficient manner. Wires and extra parts are discreetly hidden in the back of the tank. The lights illuminate the tank without raising the water’s temperature. The LED light has day and night settings. The filter is highly efficient and quiet. The price is very high in comparison to other similar tanks. The opening on top is a bit small (4 13/16 x 6 7/8 inches) which can make it difficult to place and remove ornaments from the tank. This aquarium’s unique design is something that really sets it a part from the rest. As far as appearance goes, it’s a normal fish tank contained inside a curved black wall. It comes with a water pump and filter that are hidden in the back of the tank. The filter provides advanced cleaning through a 3 stage filtration process and there is also an energy efficient LED lighting system. It also has a hinged canopy which provides easy access to the tank. The filter is very quiet and hidden from plain view. The filtration system is very efficient and purifies the water through mechanical, chemical, and biological filtration. The tank cannot be removed from the curved black canopy. The plastic material becomes easily scratched over time. Unlike the previously mentioned tanks, this one is a bit smaller in size. 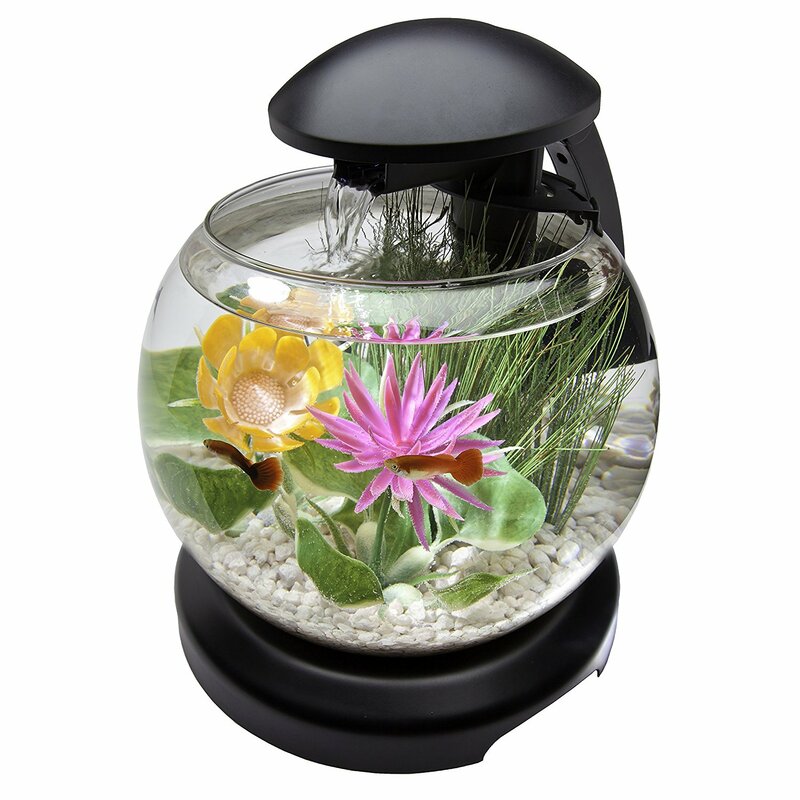 If you have betta fish or you’re simply not looking for anything too extravagant, this tank is perfect for you. This waterfall globe aquarium is easy to use and only comes with one plug to power up the light and filter unit. It is also very decorative and can be placed on nightstands, desktops, or even kitchen counter tops. It’s very compact and holds 1.8 gallons of water. Cleans water through cartridge based filtration. Plants and ornaments are sold separately. The kit only comes with one filter cartridge. Much smaller than some of the other aquariums listed on this page, not appropriate for larger fish. Another smaller sized tank is the Fluval Spec III. With a 2.6 gallon capacity, this tank is perfect for small gold fish or betta fish. It is made out of scratch resistant acrylic plastic and has a lighting system consisting of 31 small LED lights. The filtration system is efficient and purifies water through a 3 step filtration process. The aquarium is made by Fluval who are known for selling high quality products and having good customer service. Their products are reputable and this aquarium is no different. The filter and lighting cords are discreetly hidden in the back. The tank is made out of a tough and resilient material. 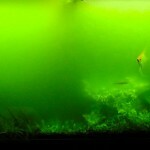 It is one of the best looking nano fish tanks on the market. It would make a sleek addition to a working desktop. The pump and filter are very quiet. This is a great choice for the bedroom or rooms you will spend a lot of time in. A heater is not provided and it will need to be purchased separately. This will add to the cost of the aquarium if keeping tropical fish. If you’re looking for a larger aquarium without having to break the bank, the API Panaview aquarium is the perfect choice. 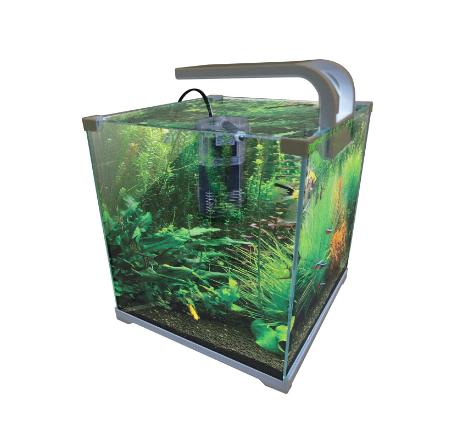 This tank holds up to 5 gallons of water and it’s constructed out of seamless acrylic material. It also comes with an LED light with seven settings for different times of the day. This kit comes with a light, filter, lid, and tank. Gravel and decorative plants are sold separately. Affordable price. This is one of the best aquariums for price/gallon ratio on the market. Comes with 7 light settings for different moments of the day. 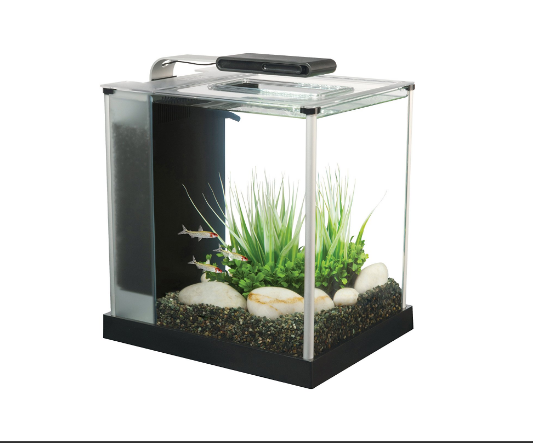 Comes with Bio-Chem Zorb 10 internal filter system which removes odours and discoloration from the aquarium. The tank’s rounded corners might make it difficult to have a clear view of the entire tank. The light bulbs are known to have a short life span and need to be replaced frequently. The fish tank has mixed reviews scoring 3.5/5 on Amazon. There is a noticeable price/quality trade off with this aquarium but enthusiasts wanting a cheap entry point can benefit from purchasing this aquarium. This tank holds up to 6 gallons and it’s made out of acrylic plastic. The filter also works with a 3 stage filtration system and it comes with cooling fans and manual day and night lighting. The top lid is made out of plastic and easy to open for cleaning and feeding. This is a great aquarium as it enclosed which reduces evaporation, noise and risk of contamination. It is one of the best aquariums for enthusiasts that already have other pets (especially cats) as they can’t directly touch the fish. It has a simple, yet practical structure to it. Perfect for someone’s first tank. Offers a panoramic view with curved edges at the front of the glass. Great for freshwater and saltwater fish. Because it’s made out of acrylic materials, it is not completely scratch proof. Care should be taken when cleaning the glass. It does not come with a heater. This needs to be installed separately. Expensive, taking into account the price to quality ratio. 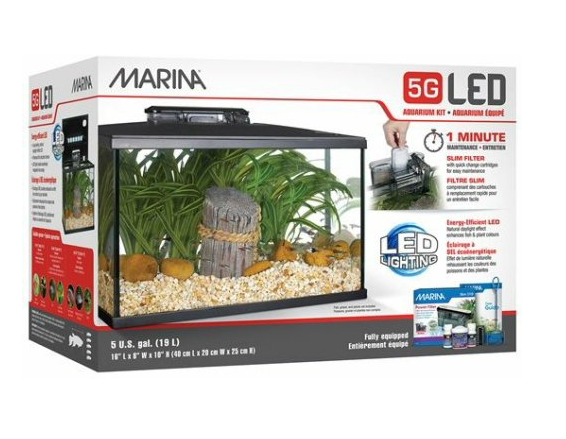 The Marina LED aquarium is perfect for beginners. It comes with basic supplies like fish food, a water conditioner, biological supplements, a fishnet, and an aquarium care guide which offers tips on how to set up and maintain your aquarium. The kit also comes with a clip on filter and a simple LED light. The basic model holds up to 5 gallons of water. It has everything a pure beginner needs to get started on the right foot. The aquarium is made out of glass and not acrylic material like other products. The LED lights are energy efficient and have a natural daylight effect. The LED lights do not have a night time feature. The filtering system is not as advanced as other products. A heater is not included. On the last spot on our list we have another smaller sized tank. Smaller tanks can be more affordable, visually pleasing, and compact, but often times they might not be good options for long term use. This particular tank is made out of glass and comes with a simple LED light. It also has an energy efficient filter pump and it can be used for both freshwater and saltwater fish. 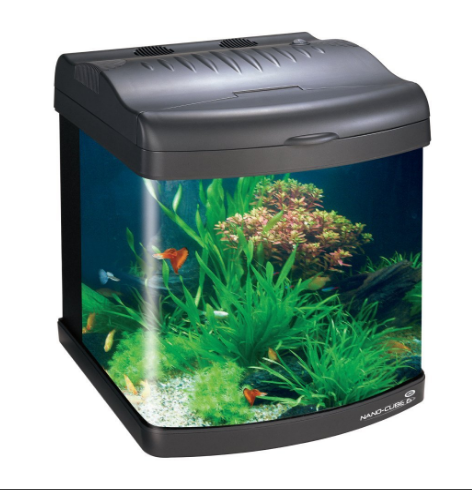 This is one of the best fish tanks for users who want an open top experience. 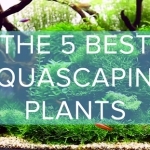 Plants and fish can look very different from above the aquarium. 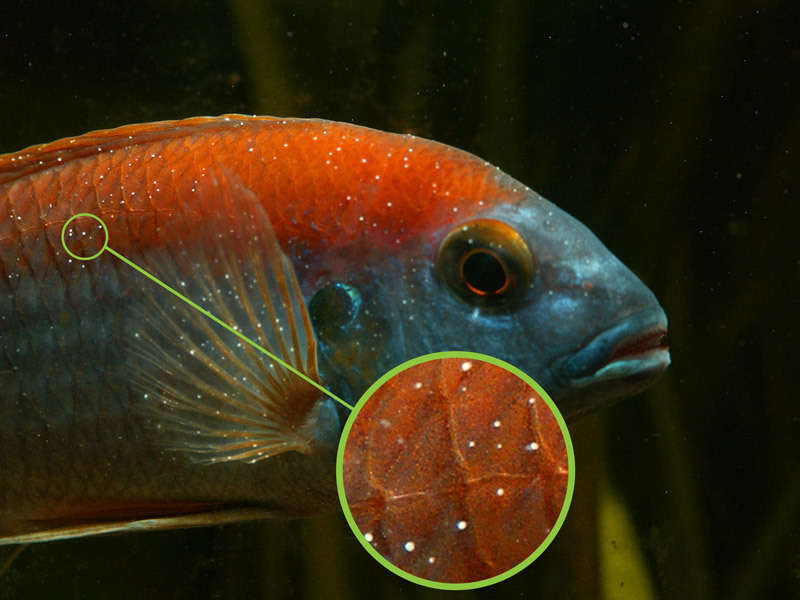 It can make feeding time quite a fun experience, however jumping fish cannot be kept without a lid. It comes with a temperature tracker. The filter is a bit low in quality and may need to be replaced every so often. The tank does not come with a lid, which might pose as an issue when it comes to cleanliness, “jumpers”, and other pets in the house. The fish tanks that we’ve just covered are all very diverse and will fulfill the needs of different people and their aquatic companions. When choosing a fish tank, it’s important to consider the quality of the product, the extras it includes, whether the product is better suited for freshwater or saltwater fish, cleanliness, and of course, the cost. 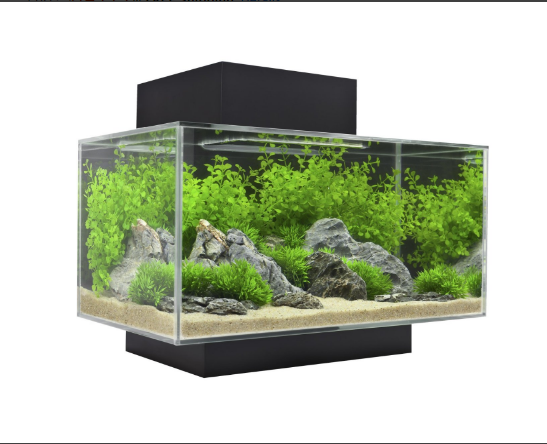 If I personally had to recommend one of these products I would highly recommend the Marineland Silhouette Square Glass Aquarium. 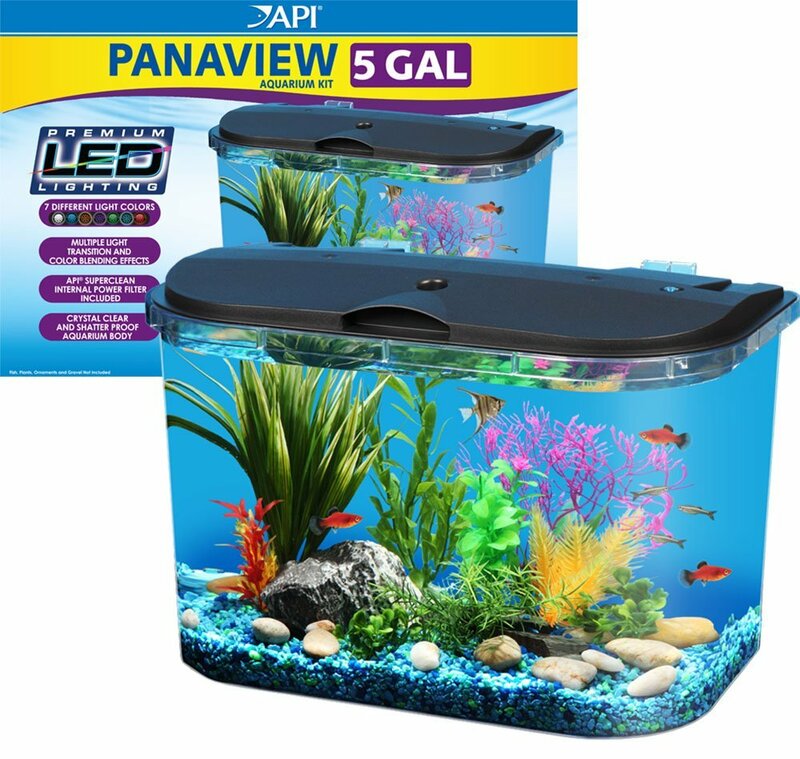 In my opinion, I feel that this tank would be perfect for someone who owns a few small gold fish or beta fish, due to the 3 gallon capacity it has. 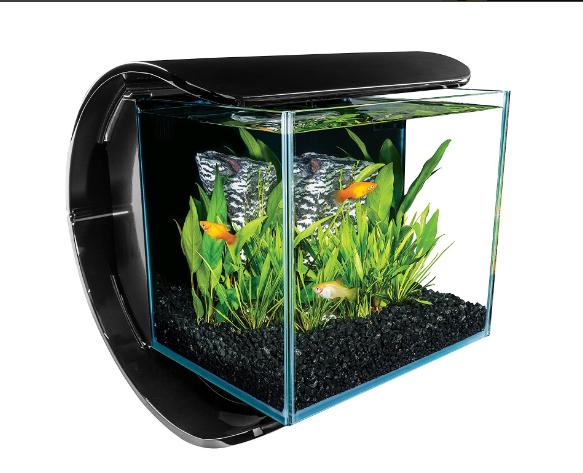 This tank is very visually pleasing due to it’s modern style so not only will it provide a pleasant home for your fish, but it will give a modern and artistic vibe to whichever room you decide to place it in. 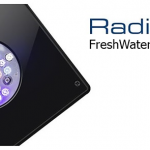 Along with it’s visual characteristics, the filtration system is excellent, the lights have day and night settings, and it is extremely easy to set up and maintain. 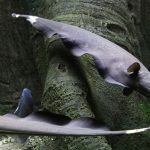 The only downside is that the plastic material covering the tank can get easily scratched over time, but aside from this small setback, the Marineland aquarium is an excellent choice. Now it’s time to hear form you! Did any of the tanks listed on this article catch your eye? 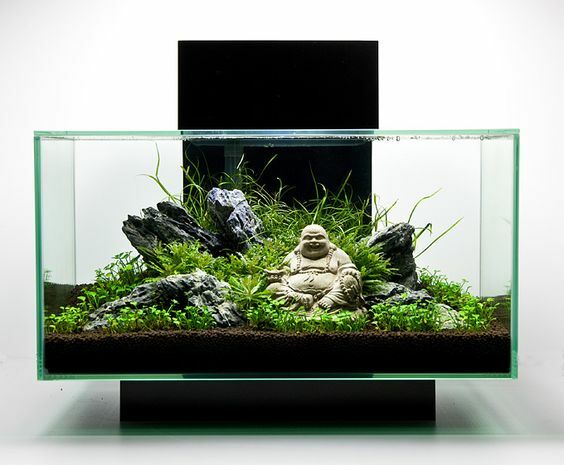 Or better yet, what would your ideal fish tank look like and what features would it have? Let us know in the comments’ section below!